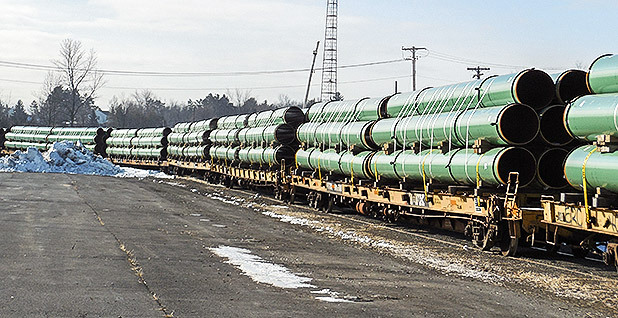 The first sections of the Constitution pipeline arriving in New York in 2014. Constitution Pipeline Co. Newly minted policy chief Brittany Bolen told FERC yesterday that EPA wants to "clarify the scope and intent" of a June 21 comment that included suggestions for weighing the greenhouse gas emissions of natural gas pipelines. The commission has been soliciting feedback on its pipeline review process for months, and EPA's climate-focused remarks last month took many by surprise. The June letter, signed by career staffer Robert Tomiak, suggested tools that FERC could use to evaluate upstream and downstream emissions from new pipelines, including EPA's greenhouse gas inventory, greenhouse gas reporting program and the "social cost of carbon" method (E&E News PM, June 22). The letter did not take a position on whether FERC should use these tools or in what contexts, but simply noted that they were available. It was pointedly vague, referring to "situations where FERC decides to conduct analyses of GHG emissions impacts of proposed projects." "[Social cost of carbon] estimates may be used for project analysis when FERC determines that a monetary assessment of the impacts associated with the estimated net change in GHG emissions provides useful information in its environmental review of public interest determination," the original EPA letter read. Bolen's clarification, filed yesterday as FERC's comment period closed, stresses that the National Environmental Policy Act and related regulations do not require FERC to monetize the impacts of greenhouse gas emissions and notes that the social cost of carbon may not be an appropriate tool for analyzing individual projects. "Moreover, EPA notes that the February 2010 social cost of carbon estimates, and subsequent related documents developed by the Interagency Working Group on Social Cost of Greenhouse Gases, no longer represent government policy," she wrote, pointing to President Trump's 2017 "energy independence" executive order, which disbanded the working group and withdrew its recommendations. Bolen took over for former policy chief Samantha Dravis this month. She joined EPA last year after working for the Senate Republican Policy Committee and the Senate Environment and Public Works Committee under then-Chairman Jim Inhofe (R-Okla.). EPA did not immediately respond to questions about Bolen's clarification or whether the June comments were authorized. The June letter was particularly notable for its discussion of the social cost of carbon, which FERC's Republican majority has argued is not meant for projects. Avi Zevin, a staff attorney at the Institute for Policy Integrity, told E&E News in June that in the normal course of events, EPA sending recommendations to FERC is not unusual, but that its focus on tools to measure emissions was notable in light of the Trump administration's moves to undo climate regulations. Democratic Commissioner Richard Glick has since referenced the original EPA comments as support for his position that FERC should take a closer look at the indirect climate impacts of pipelines.